Jitentra from London approached us to build a garden office with storage. Here at Modern Garden Buildings, we pride ourselves on our years of experience which we are happy to share with you, helping you when it comes to the practical elements of the build, like planning permission. Jitentra wanted to replace his existing garden shed with a much larger and more useful building for his compact London garden. The garden room would be used as a garden office, with an integrated shed in which to store garden tools. 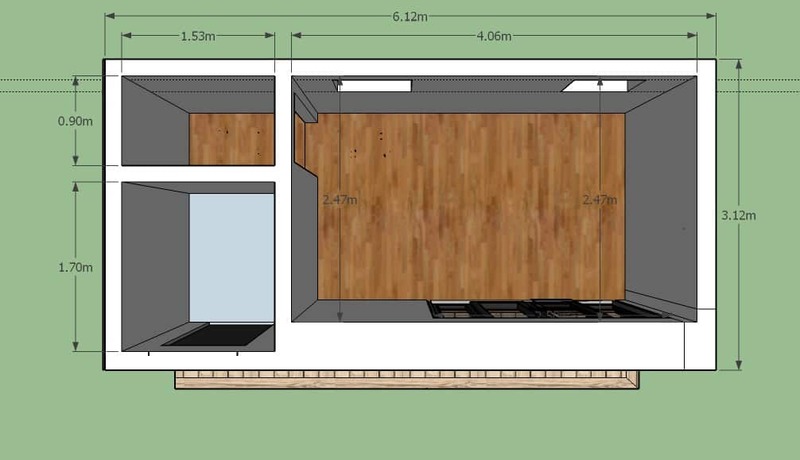 Being mindful of the size of his garden, we went about designing a garden room which would be large enough to house an office with additional storage, but small enough that planning permission and building regulations would not be required. And of course, like all of our builds it would look super stylish into the bargain! 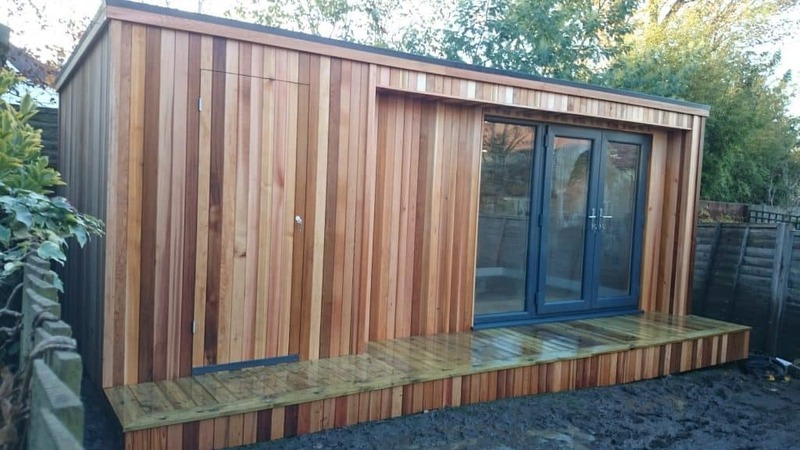 This was a 6m x 3m build combining our two most popular rooms; the concave garden room and the cube room. The garden building had a main room, with an internal doorway leading to a smaller room at the back. Additionally, a windowless shed/storage room was built to the front with its own access via a hidden door. There was 300mm decking to the front of the building, French doors to the front set within a concave section, and two windows to the back. 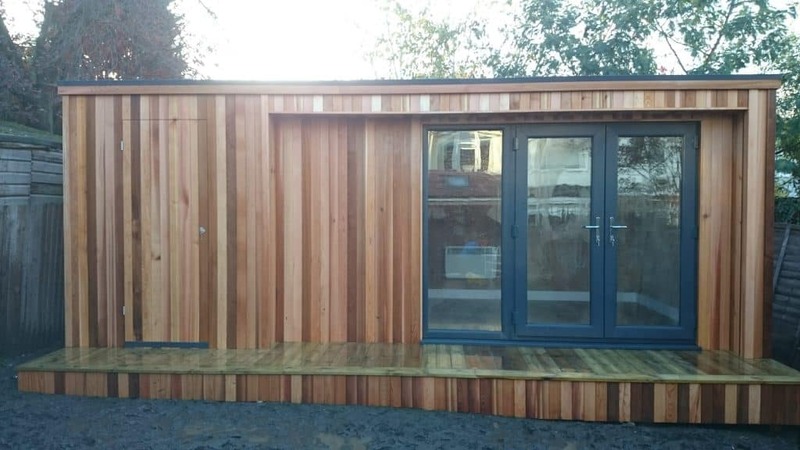 Jitentra needed a new building to use as a garden office with additional storage space, as it would be taking the place of his existing garden shed. Due to the size of his London garden, the garden room’s size was limited by building regulations, who require that buildings less than half a metre from boundaries are fireproofed which would push the cost of the building up. He also wanted a separate internal room partitioned from the main office. The design of this build was a combination of two of our rooms; the overall shape was a just over 6m by 3m and based on our cube room, with the French doors set within a concave section. The footprint of the building was designed in order to fit into the garden at least half a metre from the boundaries, so no additional fireproofing or building regulations approval had to be sought. 300mm decking to the front of the building acted as a step to access the doors to the office. 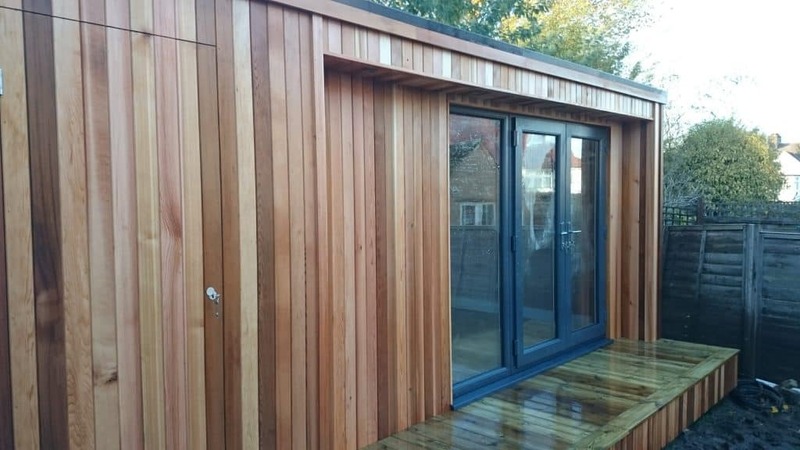 The shed door to the right hand side was clad entirely in the same cedar timber as the rest of the build to keep it ‘hidden’, giving a smooth and stylish appearance. 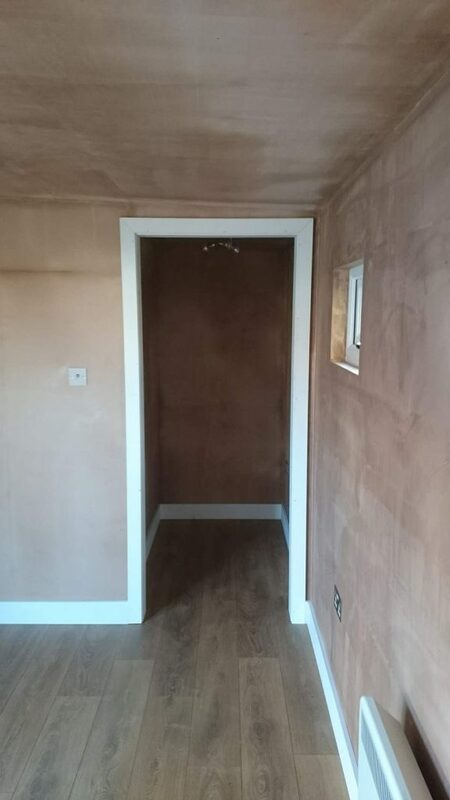 Inside, an internal wall and doorway was built to provide access into a second much smaller internal room. Electrics were run to the building to provide heating and lighting. 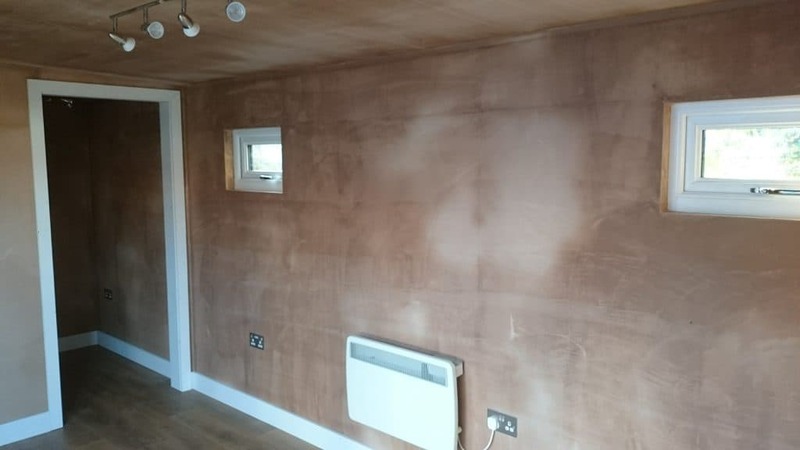 As is standard in all Modern Garden Buildings garden rooms, the walls were insulated, plasterboarded and skimmed ready for Jitentra and his family to decorate and put their new garden office with storage shed into use! If you have an idea in your head of exactly what you want in a garden room, then please do contact us, as we would be only to pleased to help make it a reality.